A pioneering study has begun in a part of Wales, UK, aimed at pointing the way towards ‘One Planet’ neighbourhoods. One of the instigators is ‘The One Planet Life’ author David Thorpe, in his capacity as an Administrator of Calon Cymru Network (CCN), a community interest company consisting of architects, planners, growers and ecologists. More than sixty people attended a public meeting in the town of Llandovery, Carmarthenshire on April 20 2017. The meeting was introduced by CCN’s patron, Dr R Brinley Jones, and heard from speakers including Dr Jane Davidson, director of the Institute of Sustainable Practice, Innovation and Resource Effectiveness at the University or Wales Trinity St David, who wrote the introduction to ‘The One Planet Life’. It was the start of a process to seek local residents’ views on the possible creation of ‘One Planet’ affordable homes at the town and, in time, at other locations close to railway stations on the Heart of Wales line. ‘One Planet’ Development, or OPD, is a Welsh Government policy for homes in the countryside where building would not normally be allowed. There are strict conditions, including the requirement for occupants to provide at least 65% of households’ basic needs from the land, and for buildings to cause no greenhouse gas emissions and be mostly made of local materials. The project would provide affordable homes and opportunities for work to encourage people of all ages and abilities to stay and live in the area. Part of the aim is to re-establish a stable local economy based on generating an income from the land and living and working in harmony with the environment. Some jobs will be created by providing services for the residents, other residents will provide goods and services for local sale, and the pioneering nature of the neighbourhood itself will attract visitors and business to the town. No public subsidies would be required. Using the railway line to better connect with the rest of the country, more jobs can be created, the soil and landscape regenerated, and a working, balanced population sustained to obtain more value from the land, living in affordable housing. 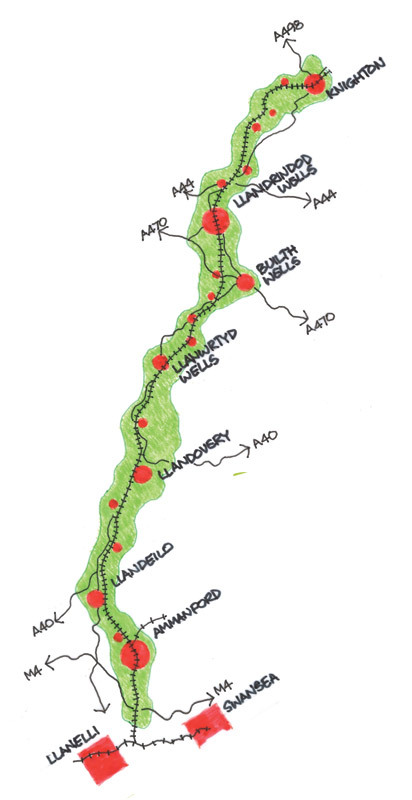 Llandovery has been chosen as the first town to get involved. CCN is offering to support other local non-profit groups and communities who are willing, with no government financial assistance, to help create these projects. Pilot projects can help to test the idea in practice before replicating them elsewhere.